Four-time USEF Equestrian of the Year, Beezie Madden, is a name that almost every horse person in the world has heard at least once. Madden has been competing at the Grand Prix level since 1985 and continues to add to her resume of Grand Prix wins every year. 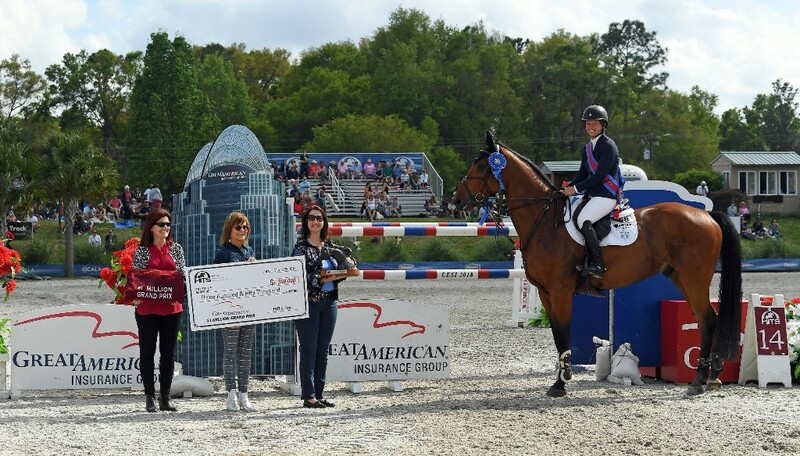 As of March 25th, 2018, she became a two-time HITS Million Dollar Grand Prix winner as well, with a victory in the Great American $1 Million Grand Prix to close out the HITS Ocala Winter Circuit. This is Madden's second $1 Million Grand Prix win with HITS, also winning in Saugerties, New York in 2015. "I've been lucky enough that this is my second win. It's amazing what he offers; all of the venues and shows he offers. I don't know how he does it all." Madden said, referring to HITS Owner and CEO Tom Struzzieri. Alan Wade of Tipperary, Ireland, designing his second HITS Million course, built a track that the riders felt was challenging, but allowed for them to ride to their horses' strengths in both the first round and the jump-off, with spots to make up ground in turns or in long gallops. "The riders who were clean were obviously thrilled, but lots of riders with just one or two rails came out of the ring very happy with their performance." said Wade, who was pleased with how the course challenged both the veteran and less experienced riders. "For the developing rider, the more they get to jump a course like this, the easier it will become for them." After a challenging round one, five riders would come back to jump off to find the winner of the Great American $1 Million Grand Prix. First to jump-off was Lillie Keenan aboard SUPER SOX, Keenan smoothly rode through the course, going clear with a time of 44.479. As the first to go in the jump-off, and to be clean and efficient, she set the bar for the rest of the riders in the jump-off. Her score would eventually be good enough for second place. Daniel Bluman was second to go aboard SANCHA LS. Being the only foreign rider in the jump-off field, the crowd cheered him on, but he unfortunately had a rail down early and would have two more down, completing the course with a twelve-fault score in 49.954. Keenan was still in the lead, but not for long. Third to go was Beezie Madden and COACH. A crowd favorite, the energy from in the Ocala Horse Properties Stadium was at an all-time high as Madden skillfully jumped fence after fence clear, taking the sharpest turns possible. The crowd held their breath just before the last fence, as COACH soared, landing clear and with a time of 44.479, almost two seconds faster than Keenan. Madden was now in the lead, but would one of the remaining two manage to top that time? Jamie Barge entered the ring aboard LUEBBO, with high hopes that she would catch up to Madden. Barge galloped the long stretches as fast as she could manage, and jumped clear, with a time of 48.461, putting her in third place. As Barge cantered out of the ring, Charlie Jayne awaited his turn in the ring aboard TOU LA MOON. The pressure was on, as he was the final rider to jump-off. Jayne rode to his mare's strength of quick, tight turns, trying to push the others out of the lead. Approaching the final fence, the crowd went wild, wondering if he would catch up to Madden. As he landed from the final fence and the scoreboard stopped, everyone looked at the time, 47.092, putting Jayne into third place. Madden had won it and the crowd applauded her as loudly as they could. Madden and COACH fly over the final fence of the jump-off. Jamie Barge entered the ring aboard LUEBBO, with high hopes that she would catch up to Madden. Barge galloped the long stretches as fast as she could manage, and jumped clear, with a time of 48.461, putting her in third place. As Barge cantered out of the ring, Charlie Jayne awaited his turn in the ring aboard TOU LA MOON. The pressure was on, as he was the final rider to jump-off. Jayne rode to his mare's stretch of quick, tight turns, trying to push the others out of the lead. Approaching the final fence, the crowd went wild, wondering if he would catch up to Madden. As he landed from the final fence and scoreboard stopped, everyone looked at the time, 47.092, putting Jayne into third place. Madden had won it and the crowd applauded her as loudly as they could. Center stage was Madden having secured the first place position and earning a check for $350,000. When asked about her ride, she said "I was really happy with how the horse went. I thought the course really suited him. I have high hopes for him." speaking of the German-bred ten year old gelding, COACH, owned by Abigail Wexner. "Everything fell into place really nicely and I had a great support team behind me." Beezie Madden and COACH, winners of the 2018 Great American $1 Million Grand Prix. Lillie Keenan had claimed the second place spot and a hefty prize money check for $200,000 aboard her well-known gelding SUPER SOX after two clear rounds and a jump-off time of 46.229. Keenan, at only twenty-two years old, has an impressive list of accomplishments, launching her career as a top Grand Prix rider at HITS when she was just sixteen years old in the $1 Million Grand Prix. 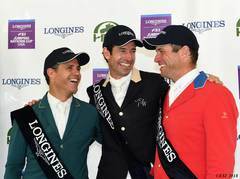 "The most profound part of the experience is that HITS offers an opportunity to riders that are maybe either young riders or haven't gotten to the point in their careers to have had the chance to jump at that level and also for that amount of prize money." Keenan said when asked what she enjoys most about showing at HITS. "For me that made a huge difference, jumping a Million Dollar Grand Prix at just sixteen." Charlie Jayne was third aboard his mare TOU LA MOON with a fault-free jump off time of 47.092. Jayne, who also competed in the AIG $1 Million Grand Prix the week before at HITS Coachella, is familiar with the Ocala Horse Properties stadium and used that to his advantage. "I thought the course was excellent today. There were a lot of options," Jayne said in thanks to course designer Alan Wade. Jayne has competed in all five Great American Millions at HITS Ocala "I want to thank HITS, Great American, and the City of Ocala. I've come to this Million every year and the crowd keeps getting bigger and bigger. This is the biggest crowd I've jumped for this year so far and the energy was really great." Jamie Barge took the fourth place finish with LEUBBO, the thirteen year old gelding owned by Kylie Co., after a clear first round and a fault-free jump-off time of 48.461. Daniel Bluman rounded out the top five aboard his mare SANCHA LS with a twelve-fault jump-off time of 49.954. 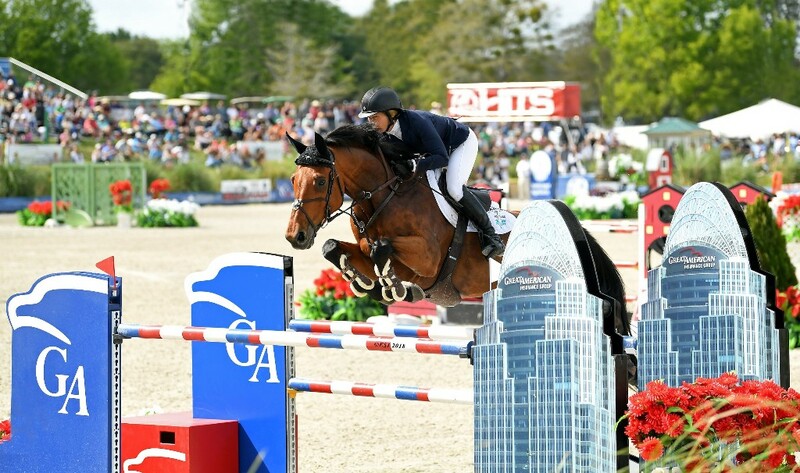 Click here for the full list of results from the Great American $1 Million Grand Prix. After the press conference, spectators and fans were invited into the VIP tent for autographs and a meet and greet with the winning riders. "If the line had been single file, I think it would have reached all the way back to the ingate," said Kristen Vale-Mosack of HITS. It was neat to see so many people excited to meet these three great riders. Congratulations to all who competed and we hope to see you next year in the Ocala Horse Properties Stadium! Visit hitsshows.com for information on upcoming shows.